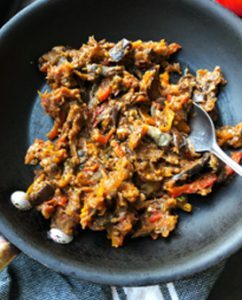 This eggplant and pepper stew using Divine Flavor peppers comes together super fast and only has 5 ingredients! Wash eggplant and slice into rounds that are about ¼ inch thick. Lay slices over paper towels and sprinkle some salt over them. Let them sit for 15 minutes to draw out moisture from the eggplant, then wipe it down. Line a large baking sheet with foil and coat with non-stick oil spray. Cover with a single layer of sliced eggplant. You may need to broil the eggplant in two batches. Broil each side for 4-5 minutes, or until you start seeing a bit of browning. When the eggplant is done, pile up the eggplant, wrap in foil, and set aside. After a few minutes, open the foil packets and let them air out a big to peel off the eggplant skin. They should come off easily. Be careful though – the eggplant could still be quite hot! Heat a large sauté pan with 1 tbsp olive oil over low to medium-low heat. Add garlic and red pepper and cook until red pepper is softened, around 5 minutes. Raise the heat to medium and add eggplant flesh, tomato paste, paprika, salt and pepper, along with 1-2 tablespoons water. Cook for another 2 minutes and turn off the heat. Adjust seasonings to taste. Blend ingredients with an immersion blender or a food processor. 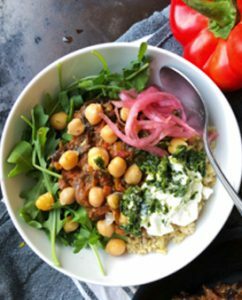 Add chickpeas, cooked grains, pickled onions, and greens to serve.